HONOLULU – Hawaiian Airlines, Hawai‘i’s flagship carrier, today announced it will launch once daily non-stop service between Kaua‘i’s Līhu'e Airport (LIH) and Kona International Airport (KOA) on Hawai‘i Island beginning Sunday, March 12. This is the first time in the airline’s history that it will connect Līhu‘e and Kona with a direct flight. The 263-mile flight becomes Hawaiian’s longest Neighbor Island route, besting its flights between Hilo, Hawai‘i Island (ITO) and Honolulu International Airport (HNL) on O‘ahu by nearly 60 miles. During the busy summer months, Hawaiian also offers direct flights from both Kona and Līhu‘e to Los Angeles and from Līhu‘e to Oakland, California. In December 2016, Hawaiian started its first-ever international service from Kona with thrice-weekly flights to Tokyo’s Haneda Airport. 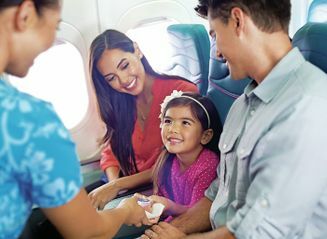 *Tickets between Līhu‘e and Kona, starting as low as $89 one way including taxes and fees, are now available for purchase online at HawaiianAirlines.com. Fare is available for non-stop, one-way flights between Līhu‘e, HI and Kona, HI. Tickets must be booked by 1/19/17 for travel between 3/12/17 – 5/24/17 and are only valid in the Economy (coach) cabin. Fares are subject to seat availability during the travel period shown. Other restrictions apply. Additional baggage charges may apply. See HawaiianAirlines.com for terms and conditions.